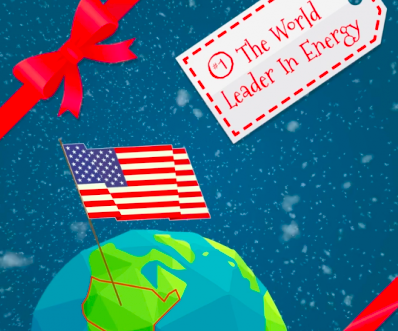 This Christmas, America can celebrate a unique ranking: first in world energy production. This is a title America hasn’t held in a long time, and it’s good to be back on top. Good, because it frees us from the uncertainty of leading energy producing nations where civil unrest (Venezuela), continued warfare (Iraq), political volatility (Saudi Arabia) or flat out hostility to the United States (Russia, Iran) can often dictate the flow and price of this precious commodity. Good, because a steady supply of inexpensive energy lowers the prices of all goods from agriculture to manufacturing, as well as shipping costs. This means Americans are spending less on materials they purchase and keeping more of their own money. Good, because it means millions of Americans in well-paying jobs are better able to provide for their families and contribute to the economy. More people working means more people paying taxes which in turn funds education, infrastructure, and other domestic needs. Good, because it means America can support our allies around the world with reliable, inexpensive energy. It weakens the leverage Russia has over Europe and puts China in the position of being a consumer. God gave America abundant resources, and we as a nation are finally aggressively and responsibly harnessing them. Every day millions of Americans are working in coal mines and in oil and gas fields, and the fruit of their labor powers the nation. This Christmas, we say thank you to them, and we celebrate what they have done for our prosperity, security, and way of life.